Bells and Chimes are very popular in yards and gardens of all cultures and can be found indoors, outdoors, and as transitions between the two. Wind Chimes have come along ways over the years. It is now possible to purchase chimes that are tuned to your favorite classical song, Chicago blues scales, Asian Temple Bells, and nearly every other scale you can imagine.Bells are also a wonderful addition to an outdoor environment that are often overlooked. However, once placed in a yard or garden, bells can quickly become a focal point. A perfect example of this are the designs by world famous Tom Torrens. The works of Tom Torrens consist of very appealing bells and gongs that will make quite the statement where ever they are placed. Not only are wind chimes and bells music to the ears, they are visually appealing as well. A famous maker of Chimes, Woodstock chimes and percussion crafts chimes that are sure to please all tastes. If you want something to fit in perfectly in a traditional European styled environment, they make chimes for you. If you like a Native American, or Asian style, you will also find plenty to choose from. The same holds true for many other styles. Bells are also a wonderful addition to an outdoor environment that are often overlooked. 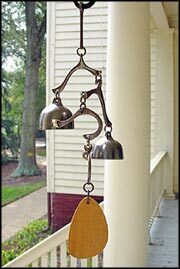 However, once placed in a yard or garden, bells can quickly become a focal point. A perfect example of this are the designs by world famous Tom Torrens. The works of Tom Torrens consist of very appealing bells and gongs that will make quite the statement where ever they are placed.